Dakar, Senegal—The two-day summit (Jan. 18-19, 2018) was organized and sponsored by the Universal Peace Federation (UPF) and the International Association of Parliamentarians for Peace (IAPP), in cooperation with the government of Senegal under the presidency of H.E. Macky Sall and the National Assembly of Senegal. Approximately 1,200 participants, including 15 heads of state (current or former), 12 vice-presidents, 6 presidents of National Assembly, 35 ministers and heads of government, 150 religious leaders were among the participants from more than 60 countries. 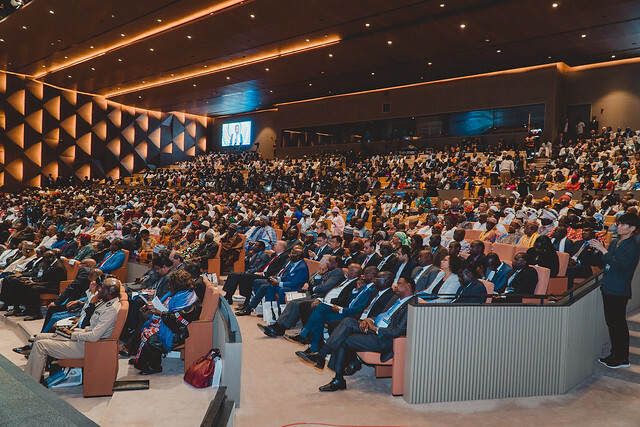 The theme of this first summit was “New Africa: Interdependence, Mutual Prosperity and Universal Values,” and was held at the Abdou Diouf International Conference Center (CICAD). Master of ceremonies Mr. Adama Doumbia, the UPF regional secretary general for Africa, began the opening session on January 18 by welcoming to the stage UPF founder Dr. Hak Ja Han Moon and the president of Senegal, H.E. Macky Sall, who entered to a standing ovation. “Character Education and Family Values” by Dr. Robert Kittel, president, Youth and Students for Peace. Starting with the founder’s address which emphasized the importance of the family as the foundation for an ideal world, this was topic that speakers over and over again brought up. This presentation directly related the Africa Summit theme of Interdependence, Mutual Prosperity and Universal Values to the importance of the family as the origin of these values. The model for realizing these ideals is the family. As was pointed out, the family is the place where these principles are first learned and experienced substantially. The Sunhak Peace Prize was introduced through a video, Living for Future Generations, and remarks by Dr. Sakeena Yacoobi, the founder of the Afghan Institute of Learning and a Sunhak Peace Prize laureate. The Sunhak Peace Prize recognizes individuals and organizations that have made enduring contributions to the promotion of peace and living for the sake of others, which often goes against common social practices. “Toward Mutual Prosperity: International Peace Highway Presentation (Peace Road)” was given by Dr. Thomas Walsh, the chair of UPF International and the chair of the World Peace Road Foundation. The International Highway Project (Peace Road) is a visionary call for a superhighway free of tariffs and passports, linking the entire globe. The project was proposed initially in 1981 by Rev. Sun Myung Moon. Dr. Walsh also put into perspective the various peace initiatives being introduced in the session “as part of a grand and comprehensive strategy to restore society but beginning at the level of the individual,” he said. “An individual who lacks integrity or is corrupt can only multiply such character and create unethical institutions,” he said—therefore the need for character education. Professor Oumar Ndongo of Cheikh Anta Diop University in Senegal, spoke about the two systems in society: “Capitalism, which was founded on individual proprietary with its tendency toward materialism, and communism/socialism, which was founded on collective propriety; however, neither system fulfills everyone’s needs.” Professor Ndongo proposed a third approach: a more harmonious system for society based on the model of the family. He gave the analogy of the human body—which functions with harmony and mutual cooperation—and society—which likewise should interact cooperatively, with each part playing a role on the individual level but also at the higher societal level. To read the second report on the Africa Summit click here.